Transparency International's 2009 Global Corruption Barometer found that citizens around the world are increasingly worried about corruption in both the public and private sectors. People are often hesitant to speak out against corruption, and see traditional complaint mechanisms as ineffective. A growing number of citizens, however, are beginning to use online technology to make their voices heard. The Technology for Transparency Network, a Rising Voices project to document and map projects around the world that use online technology to promote transparency and accountability, enters its second phase this month, thanks to continued sponsorship from the Transparency and Accountability Initiative. 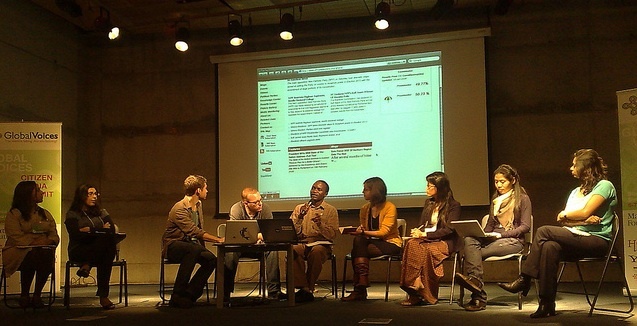 The Transparency and Accountability Initiative is a donor collaborative that includes the Ford Foundation, Hivos, the International Budget Partnership, the Omidyar Network, the Open Society Institute, the Revenue Watch Institute, the United Kingdom Department for International Development (DFID) and the William and Flora Hewlett Foundation. Between January and May 2010, the network's team of global researchers mapped nearly 40 case studies in Central & Eastern Europe, China, Latin America, South Asia, Southeast Asia and anglophone Sub-Saharan Africa. These case studies are all available on our website, along with regional overviews of the technology for transparency movement and additional chapters on the main thematic issues that emerged across the projects. We've also compiled and presented the information in our final report from phase one. Researchers from the Technology for Transparency Network present at the 2010 Global Voices Summit in Santiago, Chile. Photo courtesy of FabsY_ on Flickr. While we were able to analyze a wide variety of projects during the first phase of our research, more work is needed if we are to draw confident conclusions about these organizations, how they operate and which of their aspects might be successfully applied to future technology for transparency initiatives. By collecting a sufficiently large sample of projects from a variety of regions and a variety of thematic categories, we can begin to make statements about their strengths and weaknesses and their role in the larger accountability ecosystem. We believe that doing so will inform future research on how these projects can be evaluated for their impact on government and private sector accountability and transparency and how they affect the communities they were created to serve. The Technology for Transparency Network maps projects around the world that use online technology to promote transparency and accountability. During the next phase of the project, we will expand our research to include projects from the Middle East & North Africa, the former Soviet Union and francophone Africa. We are thrilled to welcome Hazel Feigenblatt, the Media Projects Director at Global Integrity, as our Editorial Advisor. Hazel will be working with us to help choose the most innovative and exciting projects to document. We will also be partnering with a team of researchers from Harvard University, led by Transparency Policy Project co-director Archon Fung, who will be documenting six of our case studies in depth to explore the technological and organizational design of each case and to attempt to gauge the effect of each project. How to help: give us a hand! As David Sasaki wrote when he introduced the first phase of the Technology for Transparency Network, this is a collaborative research project, and we welcome your participation. If you have an idea for a case study, let us know! We currently welcome suggestions in English, Spanish and Portuguese. You can subscribe to our RSS feed for newly published case studies and to our podcast for interviews with leading doers and thinkers in the field. Please follow us on Twitter (in English or Spanish) to receive extra news and information related to technology for transparency. Finally, if you would like to engage in debate and discussion about the application of technology to improve governance in countries outside of North America and Western Europe, please subscribe to the Transparency for Technology mailing list.